Presta valves are one of the two most popular types of valves used on bikes. It is also known as a Sclaverand Valve or a French Valve. It is made up of an inner valve embedded into the tyre and then an outer body. Some presta valves are also equipped with a valve cap which screws on and off, though this is not strictly necessary. A presta pump is a bicycle pump that is compatible with a presta valve. 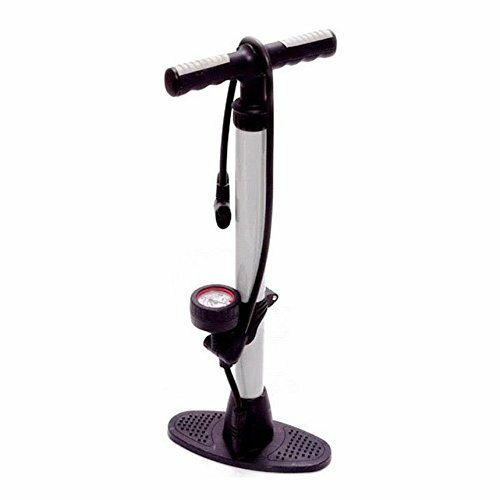 Finding the best presta floor pump for you is easy with these in depth reviews. Required pressure: do you need your tyres pumped right up to the max? Size and weight: do you want a slim, portable pump or do you prefer a large one that will stay on the garage floor? Gauge accuracy: is it important that you can measure the pressure down to a hairsbreadth? Valve types: do you need a dual head pump that can deal with other valve types other than presta? Brand: is there a specific brand you are looking for? Able to deal with both Presta and Schrader valves, this pump has a durable and yet nice and comfortable handle so that pumping up even heavy duty tyres is not too arduous. Though it has an averagely sensitive gauge, the price of this pump is above average: around £18. The most expensive item on this list (it costs around £25), this pump looks very chic with its slim yellow body and black fittings. It is reversible and so can handle both Presta and Schrader valves, and it can deal with a large maximum pressure (160 psi). One of the main selling points of this product is its gauge, which is large and clear so you can check your tyre pressure at a glance. This is a nice and sturdy floor pump, and again it is compatible with both main types of valve. As well as having a great price (it’s one of the cheapest pumps reviewed here at around just £15), this product has a stable design thanks to its tripod shape. This is the most costly item on the list (around £32), reflecting the fact that it is designed for use by professionals (though of course everyday cyclists can benefit from it too). With its padded handles and individual holders for accoutrements such as ball and bladder needles, this is a pump that has all bases covered. Like the BV Bicycle pump reviewed above, this item’s gauge is one of its main attractions. You get what you pay for with this product, as the clear and user friendly gauge works according to two different scales and not just one: the Bar Index and the PSI Index. Again, suitable for both types of valve, this sleek silver pump comes at an average price (around £13). It is easy to use and though it does not offer the best maximum pressure on this list (it can handle up to 120 psi), its gauge is very easy to read. The ergonomic handle is a final finishing touch to what is a great all round valve. No-one wants to deal with a flat tyre, or to endure a bumpy bike ride due to low tyre pressure. Whatever your budget, and whatever your priorities are (pressure, ergonomics or cost), you will have no trouble homing in on a fantastic presta bike pump that perfectly suits your needs as you scan the list above.